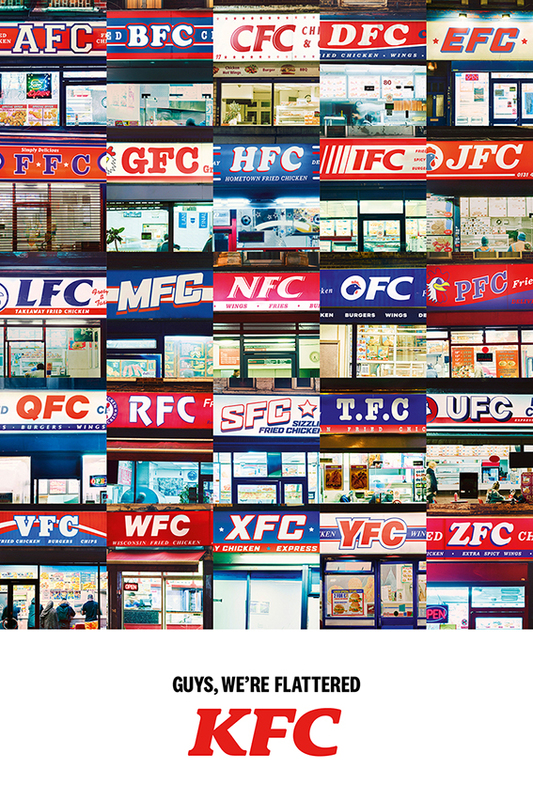 Multiplatform activity targets the many British chicken shops that copy the KFC brand. KFC is launching a major brand campaign making light of the many fried chicken restaurants that seek to emulate its name or its products. The 60-second TV and cinema ad, created by Mother, features Colonel Sanders cruising through the streets of the UK, past people eating in chicken shops that are trying to imitate KFC with names from AFC to ZFC. Despite these shops trying to copy KFC’s name and logo, the spot seeks to make the point that they are unable to compete with the taste of KFC’s "original recipe". For the soundtrack, KFC commissioned the Royal Philharmonic Orchestra to perform a special version of Love Theme, best known for featuring in The Godfather, by Nino Rota, through Universal Music and Decca Records. Decca Records is releasing this version to coincide with the ad. The ad launches tonight during the England vs Czech Republic game on ITV. Blue 449 handled media planning and buying. Meghan Farren, chief marketing officer at KFC UK and Ireland, said: "It’s flattering to have this entire legion of imitators and we wish every chicken shop out there the best of luck. But there’s nowhere else you can get the Colonel’s original recipe. "We invest time, effort and skill into freshly hand-breading Kentucky Fried Chicken in our kitchens – all day, every day – and that’s why you can only get KFC at KFC." Sam Pilling directed the spot through Pulse. James Morgan conducted the Royal Philharmonic Orchestra. Hermeti Balarin, executive creative director at Mother, added: "There’s only one colonel in Chicken Town. And his name is Harland Sanders. Capice?" The TV and cinema film will be supported by out-of-home, press, social and digital executions that feature images of the chicken shop pretenders from A to Z, with the line: "Guys, we’re flattered."